Evanston Township High School student Imani Davis took first place in the 11th-12th grade category of an essay contest organized by Mental Health America of the North Shore. 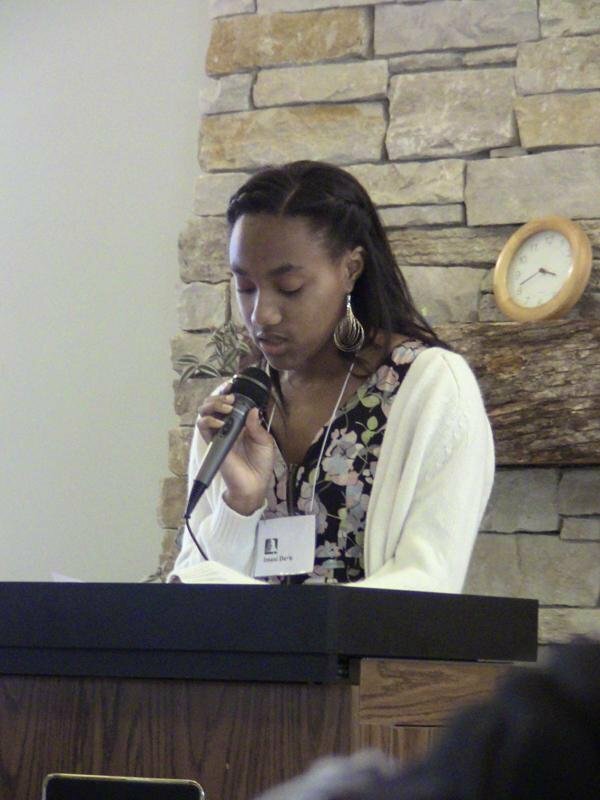 In front of about 50 people at the Evanston Ecology Center, Evanston Township High School junior Ashley Smith talked about her struggle to make sense of the death of friends from violence and accidents. “It’s difficult to come to school and difficult to know you might not see that person again,” Smith read from an essay. “That’s another way we are really trying to reach young people because we know life is really stressful for young people,” said MHANS president Dr. Kristin Kenefick, a psychologist. In their presentations, students talked about how they turned to to hobbies such as listening to music, writing and dancing to cope with stressful situations ranging from parents’ divorces to family illness. Many admitted that they had entered the contest for class extra credit points but said the project had made them more aware of mental health issues. Niles West High School freshman Amina Dzananovic, who wrote her essay about coping with an illness in her family, said she hopes to contribute to progress in mental health studies. She said she was surprised to learn she had taken first place in the 9th-10th grade category. High school students submitted about 200 entries to the competition this year, more than triple the number received last year, board members said. MHANS board of directors, which includes several psychologists, decided to introduce a poster contest this year, Kenefick said. MHANS awarded students $1,100 in total for the competition. The Forrest E. Powell Foundation contributed $1,000 to the contest, the third year it has supported MHANS, said Hecky Powell, a contest judge and the founder of the foundation. Ald. Delores Holmes (5th), who attended the ceremony, said talking about mental health issues will benefit Evanston youth.